Maeklong Railway Market nicknamed the 'Umbrella Pulldown Market is one of the largest fresh seafood markets in Thailand and is centered around the Maeklong Railway's track. Whenever the train approaches the awnings and the shop fronts are moved back from the rails to be replaced once the train has passed. ~ source wiki. Cold Mineral Water. Expect it to be iced which is perfect for the hot humid weather in Thailand. Tour costs 3100 THB for a private group tour (me, my husband and a friend) with 50 THB tip. We especially asked to be dropped off at Mo Chit sky train to familiarized ourselves with the station. In this way it would be so much easier for us to find our way back to the hotel via sky train. Rat pick us up at the Sukosol hotel at 7:30 in the morning. I was surprised that she is a lady, a hale and hearty auntie (term for an old lady in Asia) at that. 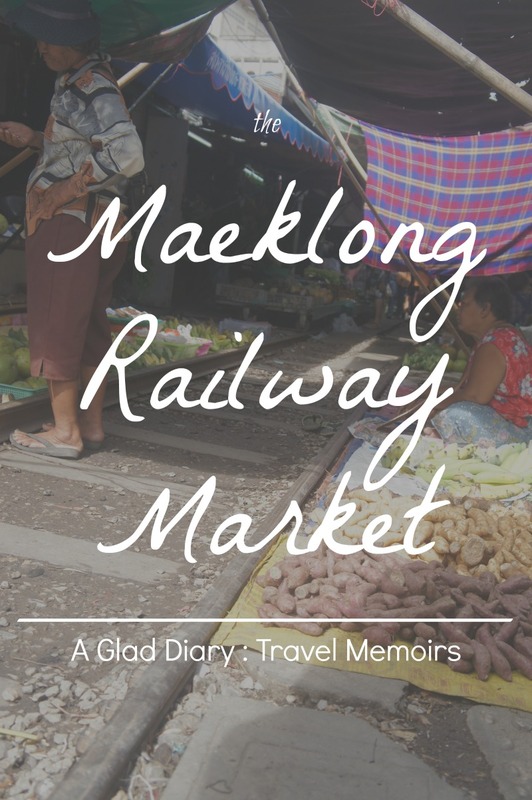 We headed straight to our first destination which is the Maeklong Railway Market. FYI, she drives so fast we realized that we arrived at our first destination sooner than we thought. We entered the market at the dead end of the railway track. TIP : If you wanted to use the comfort room near the dead end of the train railway track then prepare 3 THB for the fee. Rat showed us around the main market first before heading to the railway market. Photo above are the street vendors selling their merchandise at this side of the road which leads to the main market. Rat, our tour guide, then ushered us to the railway market. This is how it looks like before a train comes. Here I've made a before and during the train comes photo comparison of the railway market. If you want to see it live then this video I've made will be of great help. It was an awesome experience!!! Especially when the train passes at you. I was so glued at my spot because I was afraid to get hit by the moving train but then I realized I have more than enough space to move and take a video. Before the train comes, it was so entertaining to see the merchants moving their goods to a safer place (by the way the've already mastered it) as well as tourists marking a spot on where they would stand when the train comes. If you've noticed the train moves slowly this is to avoid hitting the merchandise and the people around. This totally reminds me of a movie titled 'Home Along da Riles' during my childhood back in the Philippines. I would totally recommend you to go and experience it yourself especially hiring Rat's service. She has been like a mom to us. I really really like her service. If ever you're interested to do a tour with Rat, contact her at this email : rat_bkk@hotmail.com. "This totally reminds me of a movie titled 'Home Along da Riles' during my childhood back in the Philippines." Kidding aside, Ms Rat seems like a really nice lady. @chickenrice4ever : at first it did but somehow we all got used to it... she's like a mom to us.. ahahaha!!! I'm happy we shared the same childhood.. lols! ahaha!! i think, i took the before photo way before the train arrived... much much earlier when we we're looking at the merchandise at the side of the railway track..
seems like an awesome experience. i love visiting such places.